The Avataṃsaka Sūtra (Sanskrit: महावैपुल्यबुद्धावतंसकसूत्र Mahāvaipulya Buddhāvataṃsaka Sūtra) is one of the most influential Mahayana sutras of East Asian Buddhism. The title is rendered in English as Flower Garland Sutra, Flower Adornment Sutra, or Flower Ornament Scripture. The Avataṃsaka Sūtra describes a cosmos of infinite realms upon realms, mutually containing one another. The vision expressed in this work was the foundation for the creation of the Huayan school of Chinese Buddhism, which was characterized by a philosophy of interpenetration. Huayan is known as Kegon in Japan. Chinese: Dàfāngguǎng Fóhuáyán Jīng (大方廣佛華嚴經), commonly shortened to Huáyán Jīng (華嚴經), meaning "Flower-adorned (Splendid & Solemn) Sūtra." Vaipulya here is translated as "corrective and expansive", fāngguǎng (方廣). Huá (華) means at once "flower" (archaic) and "magnificence." Yán (嚴), short for zhuàngyán (莊嚴), means "to decorate (so that it is solemn, dignified)." Japanese: Daihōkō Butsu-kegon Kyō (大方広仏華厳経), commonly Kegon Kyō (華厳経). This title is identical to Chinese above, just in Shinjitai characters. Korean: Daebanggwang Bul-hwa-eom Gyeong (대방광불화엄경), commonly Hwa-eom Gyeong (화엄경). This title is also from Chinese, the same words written in Hangeul. Vietnamese: Đại Phương Quảng Phật Hoa Nghiêm kinh, shortened to Hoa Nghiêm kinh. This title is similarly derived from the Chinese titles, transcribed in Quốc Ngữ. According to a Dunhuang manuscript, this text was also known as the Bodhisattvapiṭaka Buddhāvataṃsaka Sūtra. ^ The Divyavadana also calls a Śrāvastī miracle Buddhāvataṃsaka, namely, he created countless emanations of himself seated on lotus blossoms. ^ Keown, Damien (2003). A Dictionary of Buddhism. Oxford University Press. ISBN 978-0-19-860560-7. ^ Akira Hirakawa; Paul Groner (1990). 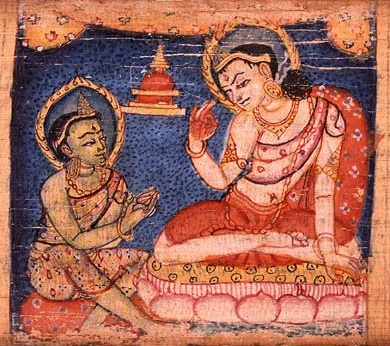 A history of Indian Buddhism: from Śākyamuni to early Mahāyāna. University of Hawaii Press. ISBN 978-0-8248-1203-4. Retrieved 12 June 2011. "The term "avatamsaka" means "a garland of flowers," indicating that all the virtues that the Buddha has accumulated by the time he attains enlightenment are like a beautiful garland of flowers that adorns him." ^ Akira Sadakata (15 April 1997). Buddhist Cosmology: Philosophy and Origins. Kōsei Pub. Co.. p. 144. ISBN 978-4-333-01682-2. Retrieved 12 June 2011. "...adornment, or glorious manifestation, of the Buddha[...]It means that countless buddhas manifest themselves in this realm, thereby adorning it."